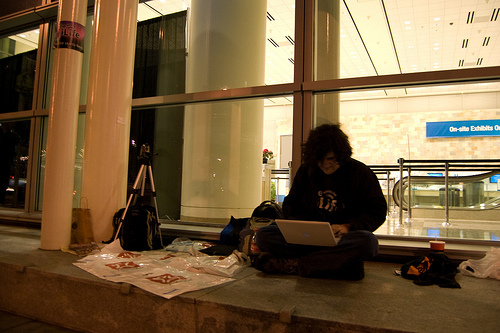 This is a continuation of Macworld Registration Part I and Part II. After Sidney and I registered we split up- I went to my AppleScript workshop and he went to start the Keynote line. Sidney waited, for the most part, by himself until about 12PM. I got my lunch from inside and took his place for about an hour from 12-1PM. Within this time, at approximately 12:30PM, the second and third people showed up for the Keynote line. Sidney came back with his lunch, and I continued on to my AppleScript workshop. From what I hear, two guys from IDG came out at about 2:30PM and informed us that the line was going to be “different this year.” They told us that they were splitting the lines up outside (opposed to inside), lining the Media, Super Pass and Platinum Pass users down 4th Street, and the “General Users” down Howard Street. Contrary to years past, where the line consisted of a heterogeneous mix of badge types- all of my ‘linemates’ packed there stuff up for the “General” line and left us alone. This came as a major disappointment to us- I was blessed with a Super Pass but Sidney only had a Floor Pass (with no Keynote access). Our hopes were to actually wait in line with everyone else! However, not deterred with the bad news, we moved our stuff down two poles to leave room for the media, and continued waiting in our new line. Throughout the night, Sidney and I journeyed back and forth to the “General” line to speak with our friends and stay sane. But unfortunately, we were not joined with anyone else on the Super Pass line until about 1:30AM. Later that night, at 3AM, there were a total of about 8 people on line and the cold had begun to sink in. A friend from the “General” line (which had grown to almost 50) invited me to go to his hotel room and sneak out blankets and pillows for the other guys in line. At this point, San Francisco was shut down- all the bars and local shops we were using for Bathrooms had closed, and there were no places open except Dennys. Sidney and I finished coding the AJAX app and SMS updater around this time, so we started charging all of our dying gadgets and computers at our power station (pictured below). We noticed some media presence beginning as Gizmodo and TUAW made rounds, of course ignoring us as the true first on line (but we did get an awesome TUAW T-Shirt!). I fell asleep at 4AM, so my memory is a bit faded, but at 6AM- I was awoken by the growing line. Look out for Part II tomorrow!